Finisher Tamara Wilson posted this delightful picture of a bunch of egg ornaments on Facebook. Seeing them gave me an idea for easy projects for you to make that will give you practice working on colored canvas and let you try out different ways to explode stitches. You may even have the thread and canvas in your stash, I know I do. 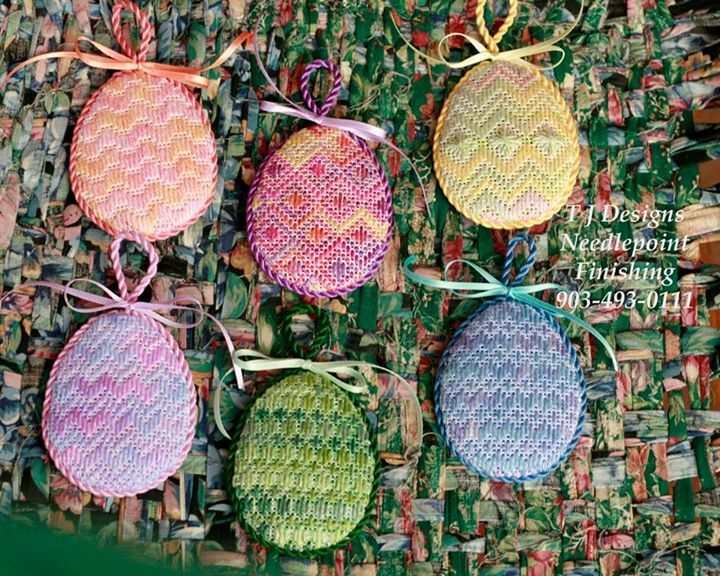 Using your overdyed thread, stitch the ornament. The beauty of these ornaments comes from the interplay of the canvas colors, usually pastel, with the more intense colors of the tread. You only get this interplay if some of the canvas is exposed. Most of the ornaments pictured here use open darning patterns, but you can do something similar with stitches you already know by exploding them. Separate rows and/or columns of the stitch by two rows. Skipping one row is too subtle for the colored canvas to really show. This can be done with any stitch made in rows or columns. Box stitches that are large look great done this way. So do some cross stitches, such as Woven Cross. Split the stitch and separate the two halves. This is a more complex process but you can find versions of Milanese that are split this way, below, then just more the oparts and rows fuerther apart. If you look in books on shadow or lite stitching you may find additional ideas. For this project you will use the full amount of thread for complete coverage.